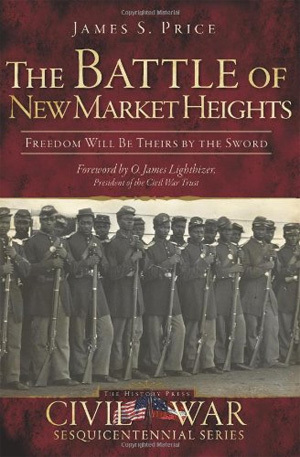 Well, in case you hadn’t heard, my New Market Heights book is out and about, so be sure to head over to your local bookstore and demand that they carry it! Assuming, of course, you have any bookstores left in your town. If not, you can order it here and here, among many other places. In the world of book signings, I will be speaking at what looks to be a first rate symposium entitled “Henrico County: Gateway to Richmond” this Friday and doing a signing after the event. I will also be at Fort Harrison this weekend signing books, so stop on by and say hello if you get a chance. I’ll be updating this site with new book signings as requests come in, so keep checking back to see if I’ll be coming to a theater near you. Finally, I wanted to point you over to the Civil War Trust’s website where you can read a brand new interview with yours truly about the book. Many thanks to Jim Lighthizer, Rob Shenk, and the great crew over at the CWT for making this happen! As always, if you’d like to set up an interview or book signing, just shoot me an e-mail and let me know! I apologize for the lack of substantive posts as of late, but after the book craze slows down look for a return to posts that don’t have to do with my book. Congratulations on the publication of your new book. Well done. I'll pick up a copy asap. All the best. 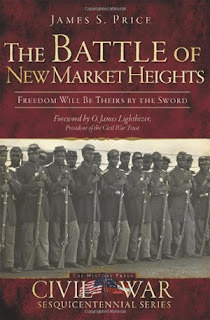 I'll put a link to this page on my blog so those who visit can order The Battle of New Market Heights. Many Congratulations Jimmy, a great achievement! Looking forward to picking up a copy. Congratulations on the book! Just ordered a copy from Amazon. Incidentally, a Texas Historical Marker application for Sgt. W. H. Barnes was submitted to the state this month (Oct 2011). If approved, the marker will be placed at Indianola, Texas where Barnes died on 12/24/1866 and was buried.